HubSpot recently introduced two major changes to their lead scoring system. Previously, your score contact property lived separately from all the rest of the other contact properties, however, since February 4th 2019, this score will now reside with all the other contact properties. Now, score is a property type, just like dropdown, checkbox or any other. The second, more interesting, change allows Enterprise customers in any HubSpot hub to be able to create up to 25 scoring properties for contacts—and if you’re a Professional customer in any HubSpot hub, you’ll be able to create one additional score property. As your company grows, you’ll want to address different audiences. You may provide new products, supply to new regions or even have a totally different target market. With multiple contact scores, you now have the flexibility to create different scoring rules for each persona, industry, buyer type, product or anything else you decide on! With this new update, we thought it’d be a good idea to look at lead scoring within HubSpot, and how you can get the most out of it. Setting up the 'automation' part of marketing automation can be daunting, especially if you’re starting with limited knowledge about how fundamental aspects such as lead scoring should work. Not to worry - this blog post will help set you on your way by showing you how you should set up your lead scoring model, one of the most important aspects of automation in HubSpot, no matter your industry. Lead scoring is the process of assigning values to each lead that your company becomes aware of. These values are numeric points that represent a lead’s suitability and interest in your product offering. Individuals earn points based on how you set up your own lead scoring model, however, the most common points tend to be earned based on how they interact with your marketing materials and information about the lead itself, such as demographics, industry and professional position. For example, let’s say the maximum score you decide upon - that is the score in which you believe a lead is ready to be converted to a sale is 10. Terry has opened 4 of your emails (+4 points), visited your website’s promotion page (+2 points) and even requested a demo (+3 points). However, Terry is also based in another country (-3 points) and is from a different industry (-2 points). This would leave Terry with a total of 4 points which means you need a little more interest or information about Terry in order to qualify him for sales interaction. If you’d like to find out more about lead scoring in general, we have a great whitepaper that goes into detail on this subject. Setting up lead scoring in HubSpot is simple enough. However, you will only be able to set up a custom scoring system if you have a Professional or Enterprise HubSpot account. If you have a regular HubSpot account, you will have to use the default HubSpot score properties. The text below was taken from HubSpot themselves on how to setup your lead scoring system. 'In your HubSpot account, click the settings icon settings in the main navigation bar. Search or browse for HubSpot score or one of your custom score properties (Enterprise users only) and click the property name. Scroll to the Calculation section. Click Add new set next to Positive Attributes or Negative Attributes to set criteria which will add or remove points from your leads' scores. Set a criterion for your attribute, then click Done. To add additional criteria, click AND; leads will have to meet all criteria for the attribute to apply. The criteria options depend on your subscription level and are similar to that of lists; learn more about using criteria. To change the number of points that are added or removed when a lead meets the criteria of the attribute, click the edit icon edit. Enter a new score amount and click Set. You can add up to 100 attributes to your score property. To add additional attributes, click Add new set. When you've finished adding attributes, click Save. To test contacts against your attributes, click Test contact. In the dialog box, select the radio button to the left of the contact you want to test, and click Test. You'll see the contact's score based on the attributes set, and see which criteria they meet. And there you have it—your very own lead scoring system! However, not all lead scoring systems are created equally. Read on to find out to get the most out of your system. Now that you know what lead scoring is and how to implement it, what are some of the best ways to implement it? Here are 5 quick tips on the best ways to implement lead scoring. Keep your maximum lead score low. The above example with Terry had his max leadscore at 10—however, if possible, you should try to keep it lower. That way, it’s a lot easier to see who is worth sending sales after, and who needs more nurturing. Divide ‘fit’ (Profiling Tiers) and Activity Grades equally. For example, have the maximum achievable points for ‘fit’ information (demographics, position, industry) to be the same as the activities a lead undertakes. This means you will be more likely to receive leads that are interested as well as a good fit for your company. Award points for the different iterations of the same action. A lead who is very engaged via email should receive the same attention and score as a lead who downloads a whitepaper and visits your pricing page, if you find the conversion rate to be the same. You can achieve this within HubSpot through building a range that awards points for the action in question on a scale. For example, you award 1 point if a user opens an email, another if they’ve opened 1 or more, another if they’ve opened 2 or more - and so on. 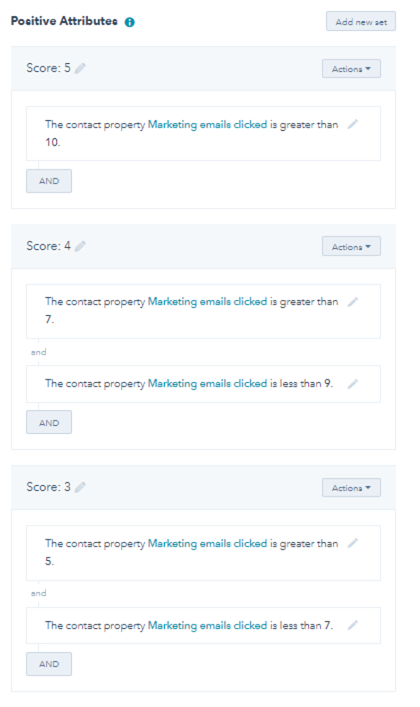 You can do this in HubSpot by clicking ‘add a new set’, assigning the appropriate action and score, and adding an “and” condition that prevents awarding points higher up on the scale. By segmenting your scores into different lists, you’re able to address different levels of interest (or even fit profiles) in a different manner. In HubSpot, you can do this by creating a new list under Contacts > Lists > Create list. Once you have created a specific list, you can assign conditions that automatically add leads to that list - such as lead score or even specific actions. The point of lead scoring is to accurately reflect how interested a lead is in your product or service. In order to do so, you need to be honest with how interested your leads are. Sometimes this means deducting score based on actions or even how long it has been since a lead as interacted with your marketing material. To do this in HubSpot, you simply assign an action and provide a negative attribute score based on that action. You can create a scale for this too, if you like, by following the same instructions on tip 3. Score your way to the top! As with all disciplines, marketing automation, content marketing and lead scoring all take time to adjust and perfect for every business. Learning about what makes your customers buy your product, what are the factors that draw them to your product and who is most likely to use your product will determine the magnitude of your success in lead scoring. If you’d like to learn more about how to get the most out of your marketing automation and lead scoring in HubSpot, look no further than Demodia. As a premier marketing agency, Demodia has extensive experience with marketing automation and HubSpot. Contact us today and find out more.